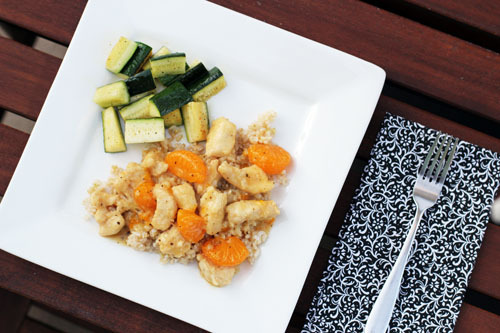 ‘Spicy Orange Chicken’ is a recipe I’ve had on the blog since the very beginning. I put it on our weekly menus regularly but have never actually written about. Well, it is a recipe that deserves some attention and today is the day! Orange chicken is one of Nate’s favorite dinners. And he doesn’t love it just because it’s Grammy’s recipe (although I’m sure that’s part of the reason!). It is just such a wonderful, homey, warm, yummy meal. My kids literally gobble it up…actually, we all do! From our home to yours, I give you Grammy’s Orange Chicken. I hope you love it as much as we do! This recipe is a classic from Nate's Mary "Grammy" McCarthy, a family favorite! Combine flour, salt and pepper in bag. Shake chicken pieces in flour until coated. Brown in butter in a large skillet over medium heat. Freezes well if you want to make it ahead of time. That looks really yummy plus I have everything on hand to make this tonight!!! I think I will just add some french green beans on the side. Thanks. also, that is one of the things I love about this dish…I almost always have all the ingredients on hand. so nice! hope you enjoy it! I just made this recipe of yours again the other night – I found it in your recipe list a while back and it’s become part of the regular rotation – a family favorite. Nice to see you give it a write up! We make it with cinnamon instead of nutmeg because that’s what I normally have in the cabinet. Love it! This sounds delicious! I’ll be trying this soon:) It’s making me hungry. I haven’t made that recipe in years! I will have to look up the recipe card (also handwritten) and make it real soon. It is by far one of my favorites including Grammy McCarthy’s Cranberry Bread. Do you have that recipe yet? I know Steven would love it! I keep saying I am going to try this (okay for the last month..). But, some reason or another I haven’t. I am still off this week (hubby is doing dinner) so maybe I’ll add it to next weeks menu. Thank you for sharing it! I’m cracking up at the “sophisticated touch” of mandarin oranges, that’s so adorable! I can barely decipher most of my mom’s family recipes–luckily my oldest sister did her best to put a family recipe book together while I was in college, you know that contained crazy things like exact ingredient amounts and proper instructions!? I crack up reading the cards where “Oleo” was called for butter or margarine. Oleo – how funny! I love handwritten recipes!! I’ve made this a few times. It is yummy! SO glad it’s been a repeat recipe for you! Nate’s grammy wouldn’t happen to be Scandinavian would she? That story is so funny! Hi Jane! Four months ago, a google search for Orange Chicken led me to your beautiful site. Since then, I’ve become an avid visitor. I finally tried this recipe last night, and my family love, love, LOVED it! 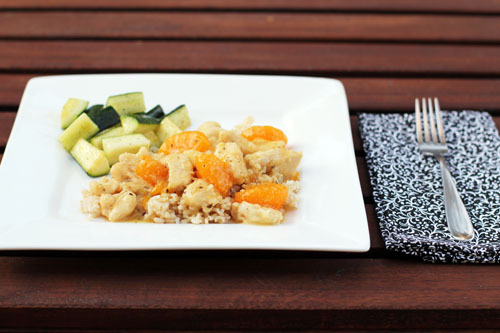 Thanks so much for sharing this superb recipe and for the fabulous job you do on this blog. We tried this last night and it was delicious! My blog is very much a work in progress but I wanted you to know I linked to your blog on my post today. Thank you for sharing such a great recipe! This sounds just yummy for dinner tonight! And welcome to ‘the neighborhood.’! I hope you like it – such a nice, home-cooked meal. and thanks – we can’t wait to settle in down there! I just made this recipe. It was delicious. I was nervous, but things turned out great. I am so happy to have a different chicken recipe. Thank you. oh wonderful! so glad it turned out and you have another recipe to add to your repertoire! Just found your site last week, and this was the first recipe of yours that I have made. Huge hit with the family, and it will definitely become a regular for us. Thank you! you’re welcome! I am so happy that you all loved it!! 🙂 “see” you around! that’s a good question! 😉 When I follow this recipe, we can feed our family with 2 adults and 3 kids and have leftovers for about 2 people. Hope that’s helpful! I made this tonight and my 3 and 6 yr old boys loved it. It was a bit sweet for me so I added some sambal oelek and it was great. Thanks for the recipe. I served it on quinoa instead of rice and cooked some green beans for the side but ended up mixing them right in. Delish! Next time, I’d probably add 1.5 to 2 tsp each of minced garlic and ginger and try cutting the sugar in half. If I thought my kids would go for it, I’d add a bird chili into it for a bit of heat but for now, I’ll just stick with the sambal oelek on the side. For the person asking about serving size, I used 3 medium sized breasts (instead of 2). For my family of 4 (average eaters with 2 adults, 3 yr old and 6 yr old), we have enough for one adult and one child to have leftovers. But I’d say that’s primarily because we had a lot of quinoa and beans. 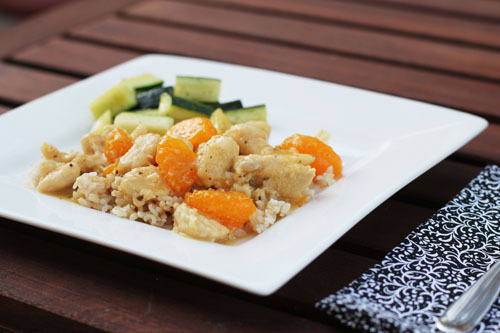 » Easy Orange Chicken Anything But Pickles!